Ken Davis & Sons, Inc. got its start in the small rural central Ohio community of Richwood in 1949. At that time our founder, Ken Davis, bought a hardware store in partnership with Glenn Hughes, and they opened the Davis-Hughes Hardware Company. Many rural hardware stores of that era had a few Phoenix and Diamond keg shoes and Capewell nails as a part of the normal inventory. Ken was an avid horseman with a special interest in the standardbreds. It was through his association with the standardbred shoers that he started to add Willie Charlie rasps, McGraw Brothers swedge molds, Heller tools, leather pads, and Miller Scossa pads to the inventory. As the inventory grew, so did the demand for better service. The track shoers started asking him if he could deliver their supplies. Ken saw this as a way to combine business with pleasure, since he rarely missed an opportunity to take in the races. 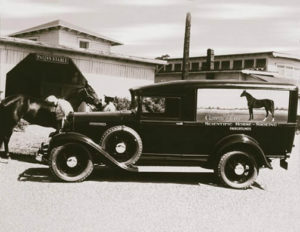 Soon he was making trips to Painesville, Detroit, Lexington and Chicago with the trunk and back seat of his car loaded down with horseshoeing supplies. For a brief period from the middle 50’s to the early 80’s we carried a full line of toe caulk steel, the only source in the U.S. at the time. There was a great demand for steel in the 50’s, 60’s and 70’s because horseshoers had to make a lot of the shoes, especially the standardbred shoers. Also during this period, Lester Hollenbach, Ray Schnaare, Rudie Hendricks and Joe Bruneau started making standardbred shoes, and we supplied them with the steel. In 1972, The Davis-Hughes Company incorporated and changed its name to Ken Davis & Sons, Inc.. The hardware business had been sold a few years earlier and sons, Don and Jon, had joined the business in the 50’s and 60’s. Don’s two sons, Scott and Dean, joined the business in the 70’s. Jon’s daughter, Gina, joined the work force in the 80’s. The family welcomed Dan Parker into the business in 1998 as the first non-family employee. Logan Rife, Scott’s son-in-law, joined the business in September of 2001. The second non-family employee Eric Shields joined the business in February of 2003. Today we are still making deliveries to the race tracks in Ohio, Indiana, Illinois, Kentucky and Pennsylvania. We also make deliveries to the Amish communities of eastern and northeastern Ohio, western Pennsylvania and northern Indiana. We have been privileged to do business in all 50 states and some foreign countries. We continue the tradition started by our father/grandfather of offering excellent service at fair prices. We are excited to be entering the newest phase of commerce, e-commerce, and hope that you enjoy your browse through our website. If you would like to comment or have questions concerning our catalog or products please contact us via e-mail, kendavis@ken-davis.com. We look forward to hearing from you.